Tremandra stelligera is a member of the Elaeocarpaceae family and is an erect or spreading shrub reaching a maximum height of two metres. The leaves are ovate up to five centimetres long by four centimetres wide, deep green, hairy above and below with irregularly toothed margins. Flowers are four to five petalled, 1.6 centimetres across, pink, purple or purple-blue. 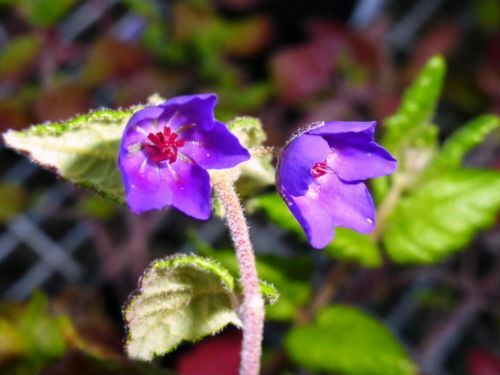 Blooms are solitary on hairy stalks and conspicuous particularly the purple-blue form. The lengthy flowering period extends from July to December. Tip pruning will improve foliage density. The form with spreading growth habit is particularly attractive and could be cultivated in rockeries, cottage gardens and as foreground plants in native garden beds. Tremandra stelligera is a native of the south-west corner of Western Australia. T. stelligera propagates readily and rapidly from cuttings. The species name means having starry hairs.